Shed Skin The Pok�mon may heal its own status problems. 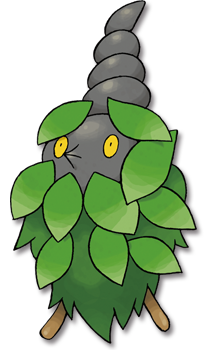 "Each turn, this Pokemon has a 1/3 chance of its status becoming normal." Overcoat* This Pok�mon does not take damage from weather. Diamond/Pearl If its cloak is broken in battle, it quickly remakes the cloak with materials nearby. Platinum Even if it is born where there are no cocooning materials, it somehow always ends up with a cloak. Heart Gold It covers itself with a cloak to shelter from the cold. When it�s hot, its cloak is thinner. Soul Silver It covers itself with a cloak to shelter from the cold. When it�s hot, its cloak is thinner. Black Even if it is born where there are no cocooning materials, it somehow always ends up with a cloak. White Even if it is born where there are no cocooning materials, it somehow always ends up with a cloak.